Today’s business climate requires a printer who understands the demands on a business. Fast turn times, special services, high-quality, and low cost will help your business succeed and grow. Our sophisticated, best-in-class printing technologies, experienced staff and understanding of the business world makes us a trusted print provider for all of your business printing needs. 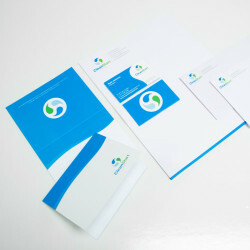 Polished business stationery is the cornerstone of your company’s professional image. Quality letterheads, business cards, and envelopes all contribute to your success and brand identity, and Capital Imaging will ensure they align with your vision and stay consistent across the board. High Gloss UV coating available. Can be single or two-sided and folded. Rounded corners and high gloss UV coating options available. Matching envelopes are available. Undecided on a paper type? Ask us for a paper swatch book so you can look and feel for yourself. Our expert graphic design team is happy to assist you with any of your project needs. Whether you need a layout, logo, or entirely new brand identity, we will come up with a solution that works for your business. Whether you want your brand’s message whispered or bellowed loudly and proudly, we have a custom vinyl decal solution for you. Our materials can be applied to store windows, glass doors, vehicles, and virtually any other smooth surface you can think of. Vinyl material can stand the test of time. The decals we produce use only the highest quality materials that can be ordered for straight or mirrored installation. We understand that when it comes to documents that are critical to business operations, they demand perfection and punctual delivery. With our on-demand services offering you the flexibility to order as many or as few as you need, we take the stress out of producing and distributing the documents you rely on to do business. We offer custom tab services and plenty of cover, binding, and paper type options to give your documents a polished look. To learn more, check out our binding and finishing services. Traveling for business? No problem. We will deliver your documents wherever they need to go* as early as next day. Email your order to hello@capital-imaging.com. Promotional materials end up directly in the hands of your consumers and need to broadcast your brand’s message with an air of professionalism. Whether you need brochures, presentations, or anything in between, we will meet the printing needs for your next sales and marketing campaign. With no quantity limits, you have the flexibility to scale your next project to your specific needs and budget. 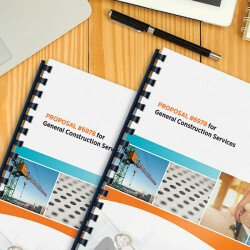 Our binding and finishing options will give your project the polished look it requires. Is direct mail part of your next marketing campaign? 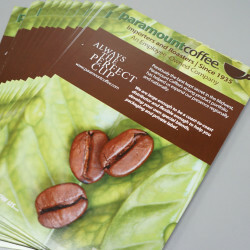 We will design, print, and even distribute your materials! 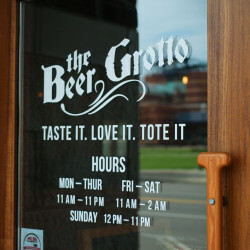 Beautiful graphics and signage do so much more than add aesthetic appeal: they help draw people into stores and create engaging brand experiences. From your initial consultation through installation, your next custom graphics project will be in great hands with our team working alongside you. 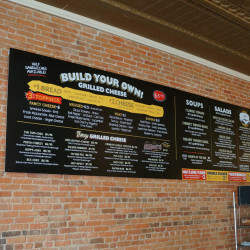 Our team is fully equipped to manage, design, produce, manufacture, and install your custom signage and graphics. Project Management – From consultation to installation, we will make sure that your project goes smoothly and stays on budget. Graphic Design – Our designers will work with your in-house team or design from scratch to make your vision a reality. Production – Graphics are produced with our best-in-class workhorses: digital die-cutters, CNC routers, UV flatbed printers, custom wall covering printers, digital presses, and more. Manufacture –We work with a number of substrates, including Dibond, Sentra, vinyl, plastic, Plexiglas, acrylic, and more. Installation – We make sure your custom graphics get installed properly, whether it be by our team or another installer. (Capital Imaging does not perform electrical sign work. We have the responsibility to comply with the licensing and regulation code requirements regarding electrical work and sign installation in city, county, and state. With our full suite of support services, your next project will be in good hands, start to finish. Enticing visual advertisements get your brand noticed. Our wide range of display graphics have a myriad of applications, so whether you need custom graphics for your retail space, an advertisement, tradeshow, or otherwise, our top-of-the-line equipment and creative team will ensure your brand stands out from the crowd. Our wide-format printers are environmentally friendly. We use water-based latex inks which are non-flammable, meet GREENGUARD criteria and do not produce hazardous air pollutants, making our wide format products suitable for hospitals, schools and any setting where using harsh chemicals and odors are a concern. Don’t see what you’re looking for here? Check out Specialty Graphics capabilities. Not seeing the materials you want? If we can print on it, we will order it upon request.